This past Sunday marked the 56th anniversary of the Kachin Revolution Day. Kachin communities around the world commemorated the Kachin Revolution Day with prayer services, songs, plays, gun salutes, and solemn processions. 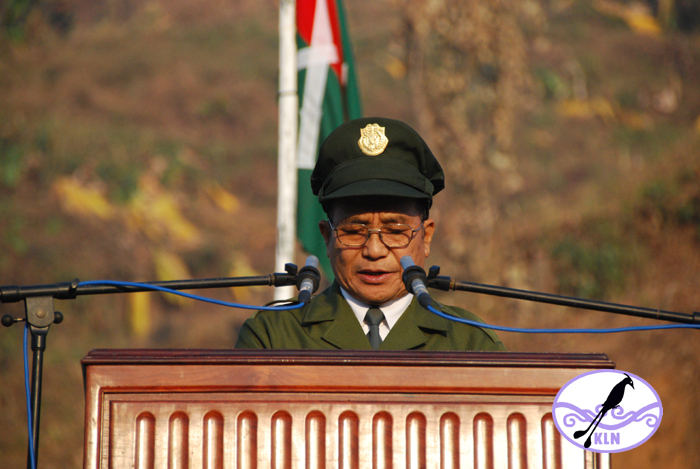 Kachin Independence Organization’s (KIO) chairman Lanyaw Zawng Hra sent a message to the Kachin public and the message was read in anniversary ceremonies around the world. When Burma Army carries out offensives against the armed resistance groups, they employ threats, arrests, murders and detention to intimidate civilians while pillaging and ransacking civilian properties. Their soldiers commit many cruel atrocities but the government protects and covers up the crimes committed by their troops. By not only refusing to lend a hand to those affected by war, the ruling government even accuses the innocent civilian victims of breaking the laws labeling them as criminals. 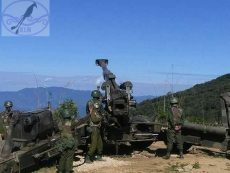 We Kachin must not give in to the violent threats, tortures and intimidation tactics used by the enemy. To liberate ourselves from tyranny, we must all embrace our common cause. We must remember the enemy use threats because deep down they fear us. We must never surrender and submit even though many Kachin civilians face extreme difficulties triggered by the government offensives. To overcome such difficulties, we must be more united than ever before to defend ourselves. We must strive to build up our community in all aspects. If we just sit and wait for foreign countries to intervene, it would just be like pouring water through a sieve. Thus, let us create a strong community so that we can stand up for ourselves when faced with hurdles. We must seek out friendly communities in lieu of interacting with those who undermine us and attempt to wipe out the entire people. We must forge alliance with those loving, honest and trustworthy neighbors. Let us love and support our Kachin people, the victims of Burmese army’s genocidal war, who fled and have been sheltering in IDP camps along the borders. We are also indebted to and extend our utmost respect to those who sacrificed their lives defending the rights of our people. You all are our heroes who fought to the last breath spilling blood on our own soil offering your invaluable lives to protect us. We will always remember you and hold you in high regards. It is also our responsibility to look after the family members survived by our heroes. I would also like to extend my greetings and encouragements to those severely injured in the battles. Despite the sickness and injuries you suffer, you continuously contribute to our common cause without losing hope. I also want to express my gratitude to those of you who have been providing food, medicines, clothes and keeping our frontline soldiers in your prayers. The revolution is strongly supported by Kachin public and we have shown the world that it is indeed the people’s revolution. I salute our KIA soldiers who engage the enemy with superior weapon systems and military might. There is none among us who does not recognize your bravery and courage. You have ignited a deep driving desire in all of us to actively participate in the revolution to free ourselves from tyranny . Let us work together to eradicate opium and other drugs which stands in our way to constructing a better society. The selfish people who engage in drugs business are on the same side with the enemy, thus, they are the sole enemy of the Kachin public. Anyone who attempts to disrupt our campaign to eradicate opium must be considered our enemy. Those engaged in opium eradication campaign must also enforce just rules and regulations in their endeavour. I encourage you to strive to be an organization recognized, supported and participated by the entire public. I would also like to encourage the people seeking shelter in various IDP camps to not lose hope. The enemy has created such situations as part of their military campaign. Dwelling on the thoughts of homes, farms and belongings you have left behind will only drain out the energy. You may have deserted your villages because of the ongoing battles, but everything you left behind still belongs to you. Nobody has the rights to seize your properties by force. I would also like to request Kachin public to visit and offer encouragement to those living in the IDP camps. Those serving in the KIO/KIA must also carry out their duties responsibly. You must refrain from actions and conducts which will drive the public away from the mother organization. Be selfless and treat civilians with utmost respect. To those who are assigned at the frontlines, have no fear but be on the highest alert to defend our land. You must remember the enemy you face are attempting to wipe out the entire Kachin population. Remember the Kachin public is in full support and you are all remembered in their constant prayers. A revolution fully supported by its civilians will surely lead to victory. The leaders and elders at KIO/KIA must also be the pillars to look up to in our struggle against tyranny. You must work to strengthen the organization carrying out the responsibilities entrusted to you. Offer useful advice to different layers of committees in the organization to make better decisions. While cultivating more competent leaders across the organization, we must also focus to work in unison. I would also like to encourage those who have been threatened, tortured, physically abused, detained as part of the enemy’s policy to wage war against Kachin public. Your rights are violated just because you were born a Kachin. Despite the ordeal, let us take pride in being a Kachin knowing that justice will prevail in the end. The Burmese government along with its army are now in unison fabricating stories covering up the actual events inside the country to the world. In times like this, it is imperative for Kachin political parties not to jump the wagon without thinking twice. It is a very important time period for us to look beyond short-term opportunities in order to make wise decisions dictating the future of Kachin people. In a time like this where all of us have been attempting to create upward social mobility, we must not take the wrong steps, I would like to remind you all. In conclusion, I want to expound the root cause of current military engagements to be political dominance of the Bamar government. The crux of the power lies in Burma majority’s hand while suppressing and attempting to wipe out other smaller groups within the country, a catalyst to the ongoing civil war. Taking the wrong step in politics in the past has cost us 70 years of hardships; therefore, we must carefully wade through the current political waters. Although people are generally encouraged to leave the past behind and move forward, this is not something we must easily forget. Learning from the past mistakes, we must make better decisions for the long run. Although other nations have advanced in many aspects, Burma remains a destitute land mired in internal conflicts and civil wars instigated by its government and army. I would like to encourage all Kachin people to not wither and lose sight of the political goal we want to achieve in the face of military offensives against us. I want to take this opportunity to thank Karai Kasang for enabling us to overcome a very difficult year of 2016 despite many obstacles we encountered. I wish the new year 2017 be filled with blessings from Karai Kasang. I would like to conclude the 57th Kachin Revolution Day by wishing you all good health throughout the year. May the blessings from the Karai Kasang be upon Kachin people and Kachinland.